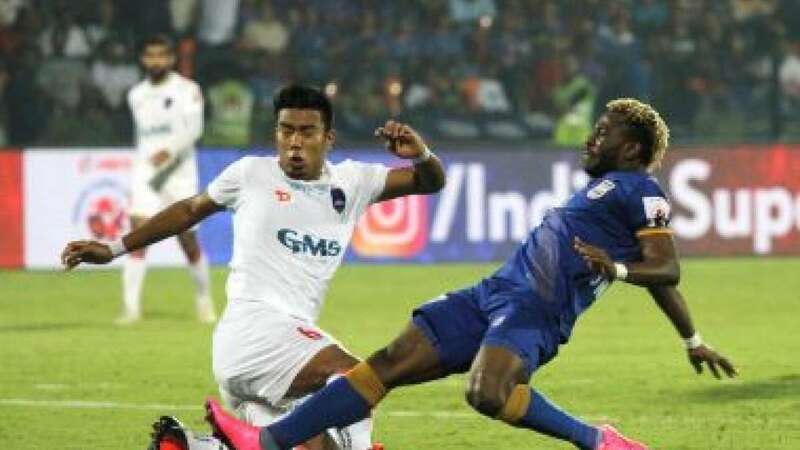 Mumbai : Mumbai City FC ended their League engagements with a goalless draw against Delhi Dynamos to finish on top in Hero Indian Super League at Mumbai Football Arena, Mumbai. The draw left Mumbai City on top of the table with 23 points, a tally that none of the other qualifying teams can overtake. Delhi Dynamos have 21 points from 14 matches and they will know of their position only after the concluding League clash between Kerala Blasters and NorthEast United FC on Sunday. The draw also means that the two teams - Mumbai City and Delhi Dynamos will not meet in the semi-finals leg. Both teams had qualified for the play-offs before this game but their approach was entirely different. Delhi Dynamos coach Gianluca Zambrotta made as many as eight changes with marquee signing Florent Malouda on the bench, while Mumbai City coach Alexandre Guimaraes had promised to field his best squad and he stuck to his word with a strong side. India captain Sunil Chhetri was the only absentee as 20 year old Udanta Singh made an impressive debut in the ISL. Mumbai City were the better team for the entire game, particularly in the first 45 minutes when they had six attempts on goal. Delhi Dynamos had only one shot and none on goal. Mumbai marquee Diego Forlan was the first to test the rival goalkeeper with a fierce shot after the Uruguayan striker had controlled a perfect cross from the other end by Brazilian midfielder Cafu. Forlan’s shot, however, was blocked by Delhi goalkeeper Toni Doblas. Doblas also had to stay alert towards the closing stages of the opening half when Cafu played a ball for Sehnaj Singh on the right but his shot was palmed away for a corner by Doblas. In the second session, both teams went close and the match could have gone either way. Interestingly, both teams hit the post in successive minutes. In the 72nd minute, Cafu picked up a ball just outside the box and took a snap shot on goal which rattled the post with goalkeeper Doblas looking helplessly. A minute later, Bruno Pelissari was unlucky at the other end for Delhi Dynamos as his shot from outside the box took a deflection and struck the post. Mumbai’s last chance to finish their engagements with a win at home came in the 83rd minute. Diego Forlan’s delivery was aimed at Lucian Goian who headed it across the face of goal. Udanta thought he had a chance to head it home from close range, only for Brazilian defender Gerson Vieira to distract him and allow Doblas to collect the ball safely.